Made from glossy plastic, the Neo features gentle curves, yet has a solid feel in use. It's neat but hefty, and its screen, which measures 3.7in, appears smaller than it really is, thanks to Sony's icons and widgets. Battery life is pretty much what you'd expect from a smartphone - it squeezed 15 hours out of a full charge when operating 3G, Wi-Fi and push notifications. We were stunned by the picture quality and video was top-notch too. However, we did experience some lag when opening apps, as the 1GHz chip just didn't seem to be able to keep up. Finding our way around the phone was a smooth experience, due to the responsive display but there were freezes and lags. Plus it lacks a setup screen to help you sync social networks and email. 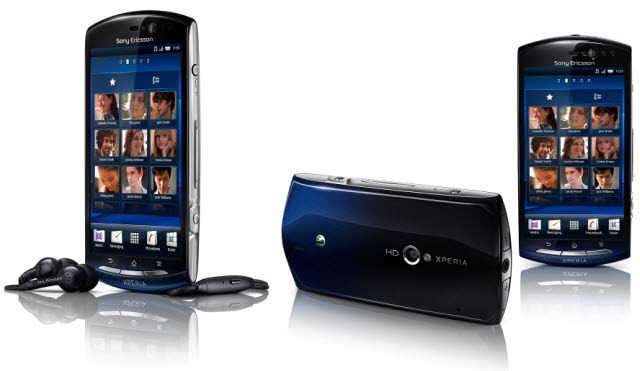 If you're familiar with the Xperia Arc, imagine a chunkier handset with a smaller display and there you'll have the Xperia Neo. The Neo includes a similar set of hardware - including Sony's own HDTV graphics technology, but it costs less and is just as useful for playing games and media. So is that lower price tag enough to win us over? Sony's Xperia Neo is a smartphone that runs on Android Gingerbread but is skinned with Sony Ericsson's own interface. As we've come to expect from Sony Ericsson, it looks great - boasting a glossy, stylish body, consisting of a plastic chassis with metal sides. It has gentle curves and, despite the fact that its screen is only 3.7 inches, as compared with the 4.2in display on the Arc, it still weighs in at 126g (the Arc weighs 117g). A red version will be available exclusively from Vodaphone. It measures 116x57x13 and we'd say while it's still neat, it's not waif-like. But it does mean it fits into a pocket nicely, and yet still offers the double delights of Sony's Bravia Engine and Reality Display - things you usually see on Sony's HDTVs. The display is about the same size as that on the iPhone 4, and has a resolution of 480x854 pixels. Despite its size it actually appears small (which we think has something to do with Sony's rather fiddly widgets and icons). When it comes to buttons, there are plenty to choose from - on the front are three for home, menu and back, and on the right edge are the dedicated snapper button, a zoom/volume rocker, an on/off key and an LED - which shows you when you have events waiting. On the top of the device sit a miniUSB charging port and HDMI port. Both have rather fiddly little covers that are designed to keep out dust and dirt, but which are really difficult to open. There are two cameras - a front-facing one is designed for self-portraits and video calls, while on the reverse sits an eight-megapixel camera that can also record 720p video at 30fps. The onscreen keyboard is very cramped in portrait mode - and we have small hands! - we still found we were hitting full stop instead of space. Another niggle is that all symbols appear on a second screen (apart from full stop and comma), which is doubly annoying because the autocorrect function is not capable of adding apostrophes when typing contractions. We were surprised that the Neo was so slow, considering the fact that it carries a 1GHz chip under its bonnet. It only has 512MHz RAM (compared with the Arc's 1GB) so perhaps that's why it lags behind by about a second. We encountered no problems switching between the five personalised homescreens but there were lags evident if we opened or switched programs. We even experienced screen freeze when we tried to use Messages - and we ended up having to open a new program to address the problem. Nowadays, accessing social networks over your mobile is an expected function of a smartphone - and Sony Ericsson has taken it one step further by deepening the integration possible on its Timescape program, which will sync your Facebook contacts to your phone list. Timescape also brings together Flickr, Twitter and Facebook feeds - but you do have a choice whether you see only one or some of these. The internet browser is pretty much what we expected - you can double-tap to see 100% page view, pinch to zoom and copy and paste. To do the latter you need to hold down on the screen, and manipulate the two arrows that pop up to highlight your text - then use a single press to copy. So how about its basic features - like texting for instance? That works fine - but the fact that the touch screen keyboard is not terribly accurate - and that the autocorrect is wildly out of touch - does not help matters. Making calls should also be simple surely? But unfortunately the dialler is not intuitive and typing in a contacts' name does not make their number pop up - no, you'll either have to enter the number in yourself, or take yourself to the contacts list, enter the first letter of your friend's name, choose their profile and then tap on the number (even if they only have one listed). However, the Neo comes into its own when it comes to multimedia. Its eight-megapixel snapper produced excellent images in almost any light - and in low light the LED flash did a good job. Some phone cameras suffer from overexposure when using flash but thanks to the Exmor R sensor, which lets in more light and so can work out the light levels more precisely, we didn't experience that - plus colours were pretty true and images noise-free when zooming in on a monitor. We always love to see a dedicated shutter button on a mobile, so it was disappointing that this one didn't always work first time - but when it did, shutter speed proved quick and we managed to avoid blur even on moving subjects. When it comes to video, you should get 720p at a DVD-quality frame rate, but it didn't quite live up to the quality of the still pictures - and we didn't think the frame rate looked like the claimed 30fs, although the colours were good. There are some things we do love about the Neo though. For instance, start up a new message and you can simply choose whether it is a text or email by choosing the address or number to send it to. Your emails and texts are kept separately and as Android users will know, your Gmail is not kept with other emails. We also like the fact that Sony has made more of its Facebook integration - you are able to sync FB albums with your handset, get push notifications of FB events on your lock screen and see what tunes and movies your FB contacts are linking to - using Media Discovery. But we do wish that Timescape was better. It's really clunky - we dislike the way you have to carefully inch forward the cards of status updates in their Rolodex format. Nor is Timescape any better for Twitter users - hit a Twitter update and you'll end up on the mobile site - it's just complicated and makes life harder than it should be. In the end we just deleted it. If you want to transfer files on a wireless connection, you can use the Media Server app to connect the handset to a Windows 7 PC. The devices will need to be linked using an HDMI cable, so that you can watch video played on one device on the other - and you'll have to buy one as Sony Ericsson has not included one in the box. We also had trouble playing video because the phone's native video player only supports H.264 , MP4 and WMV video - not popular formats such as MKV, Xvid, or DivX. We found the Neo's performance rather erratic, so while Facebook integration is top-notch, the Timescape widget for social network integration is clunky. The snapper hugely impressed us, but the handset did less well on basic features such as texts and calls. We do understand that phone makers want to make their Android devices different from all the others but many of the changes Sony Ericsson has made actually make the handset harder to use. This is so unlike our experience with HTC's excellent Sense UI, for instance. As a midrange handset, the fact it has a 1GHz chip is excellent, and yet it still suffers from freezes and glitches. If you really want a decent camera phone, this is a good choice at the price, but for a better all-rounder, we think you'd be better off looking elsewhere.